Creativity with concrete. Thanks to a variety of mold patterns and coloring techniques, stamped concrete provides an endless variety of decorative surface treatments. Get more from a concrete pour. Instead of settling for a dull, uniform concrete surface, concrete stamping can make every project unique. With concrete stamping solutions from Bowman Masonry & Waterproofing, the options are endless. Whether you are installing a new patio or restoring an existing one, our experts can help make sure your stamped concrete will last. Stamped concrete rocks! That’s the opinion many people share when they discover the versatility, beauty and affordability of this innovative paving technique. Contact us today for a design consultation and estimate. 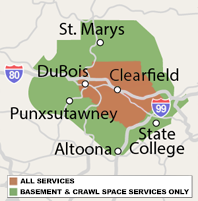 We serve Altoona, State College, Bellefonte, Du Bois, Saint Marys and the surrounding Greater Clearfield area. At Bowman Masonry & Waterproofing, we specialize in a variety of concrete repair services, like concrete grinding, resurfacing and more. Contact us today to learn about all the ways we can help! Although the term “stamped concrete” may seem to imply a uniform manufactured product, nothing could be farther from the truth. In the hands of skilled technicians, this concrete finishing technique creates truly one-of-a-kind floors, patios, walkways and pool surrounds. The secret to this unique capability is in the technique itself –using different stamping patterns, combined with textured surface molds and color variations. Color can be added in several ways: liquid dyes, pigment powders or acid-based stains. In addition to the primary color used to stain the paving “stones,” a secondary grout color can be incorporated to simulate grouted joints. Stamping patterns vary from uniformly spaced bricks to randomly sized flagstones and cobblestones laid in fan-shaped patterns. Finally, the stamping molds also impart a variety of textures – everything from smooth tile to weathered stone. 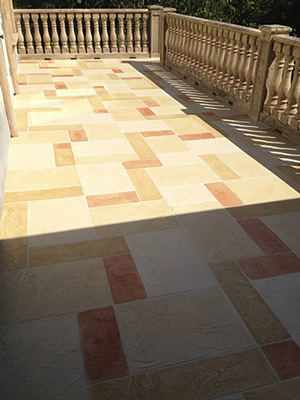 Stamped concrete can be used in numerous applications. In addition to creating exterior traffic surfaces like walkways, patios, driveways and pool surrounds, it can be used as a finished interior floor. The application technique will work in new construction and also as a resurfacing technique over existing concrete surfaces. Our concrete stamping and concrete repair services are available in Saint Marys, Bellefonte, Altoona, State College, Du Bois, Tyrone, Port Matilda, Kersey, Brockway, Ridgway, Pennsylvania Furnace and throughout the surrounding area. To learn more about the exciting possibilities of stamped concrete, call the experts at Bowman Masonry & Waterproofing to schedule a free consultation. You can also contact us online to schedule an appointment.